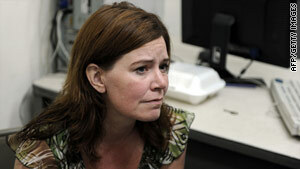 Laura Silsby was jailed January 29 in Haiti, but she's now back on American soil in Boise, Idaho. (CNN) -- Laura Silsby, the American missionary accused of trying to take nearly three dozen children out of Haiti after the January 12 earthquake, returned home to Boise, Idaho, on Tuesday after being held for nearly four months in a Haitian jail. Silsby was greeted by her church pastor, Clint Henry of Central Valley Baptist Church, and other congregants when she arrived at Boise Airport, video from CNN affiliate KTVB showed. The group marked her return by singing a hymn. Silsby was seen singing and swaying to the music, with one hand raised in the air. Silsby was freed by a Haitian court on Monday and immediately headed to the Port-au-Prince airport to board a flight for Miami, Florida, that evening, according to her defense attorney, Chiller Roy. Roy declined to comment on reports that Silsby had been convicted and freed on time served. Silsby did not take any questions Tuesday from media members at the airport. Henry spoke briefly on Silsby's behalf, saying her family's "deepest gratitude goes out to the countless people around the world who offered their support" during her detainment. Henry said the church "continues to keep the suffering people of Haiti in our prayers." Silsby was charged with trying to arrange "irregular travel" for 33 children she planned to take to an orphanage she was building in the Dominican Republic. She was jailed January 29, along with nine other American missionaries, after the group was stopped while trying to take the children out of the country. The nine others were later released. Silsby originally said the children were orphaned or abandoned, but the Haitian government and the orphans' charity SOS Children say that all have at least one living parent. Some said they placed their children in Silsby's care because that was the only way they knew to ensure a better quality of life for them. The 10 Americans have said they were trying to help the children get to a safe place after the 7.0-magnitude earthquake flattened cities and towns.